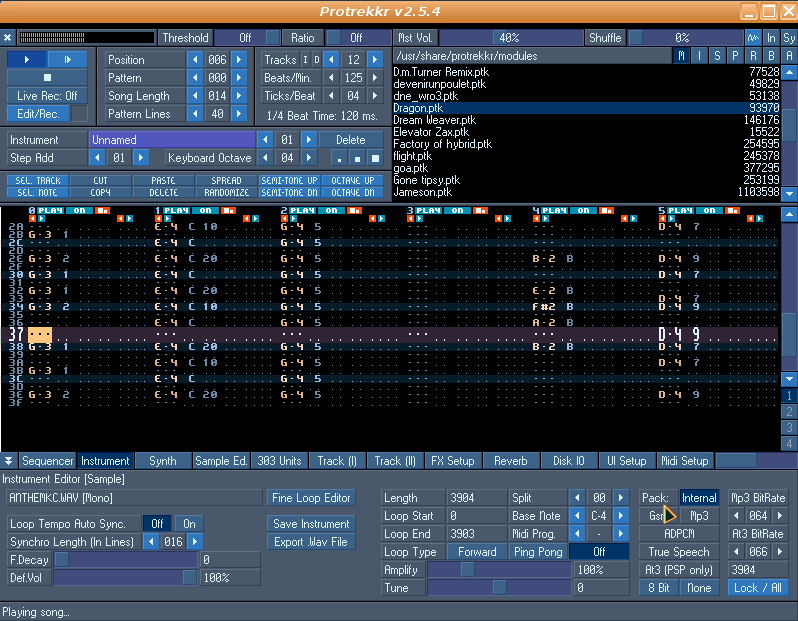 Protrekkr is a multi-platform tracker program with a pattern-based, 16-track sequencer, and includes much in the way of sound synthesis capability. It was previously known as Noise Trekker, created by Juan Antonio Arguelles. The source code for download (but also available for direct installation in the KXStudio repositories) is maintained by falkTX and available at Github (see link at bottom). The audio demos above are of full, pre-packaged song demos rather than individual instrument demos (although Protrekkr comes with a variety of very interesting synth presets already available for use). 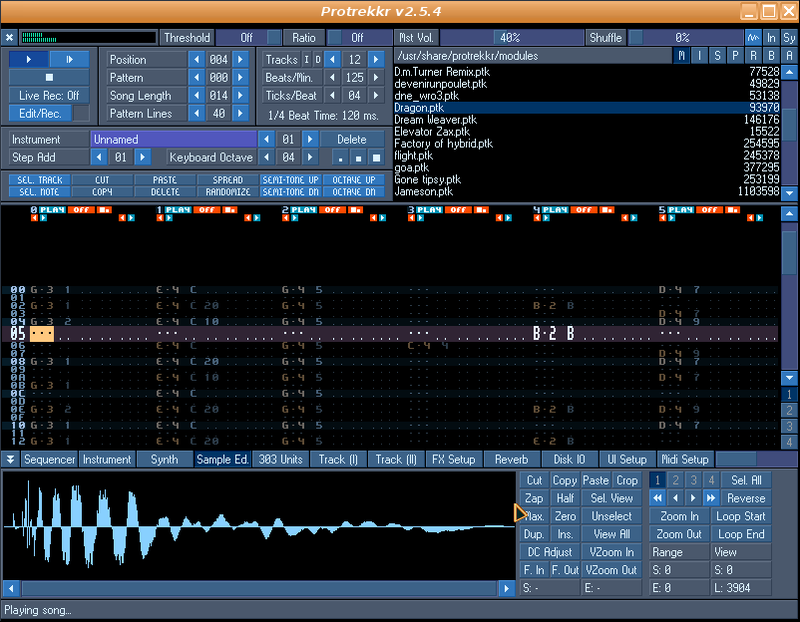 Protrekkr includes a realtime software synthesizer engine and is also able to import external waveforms. 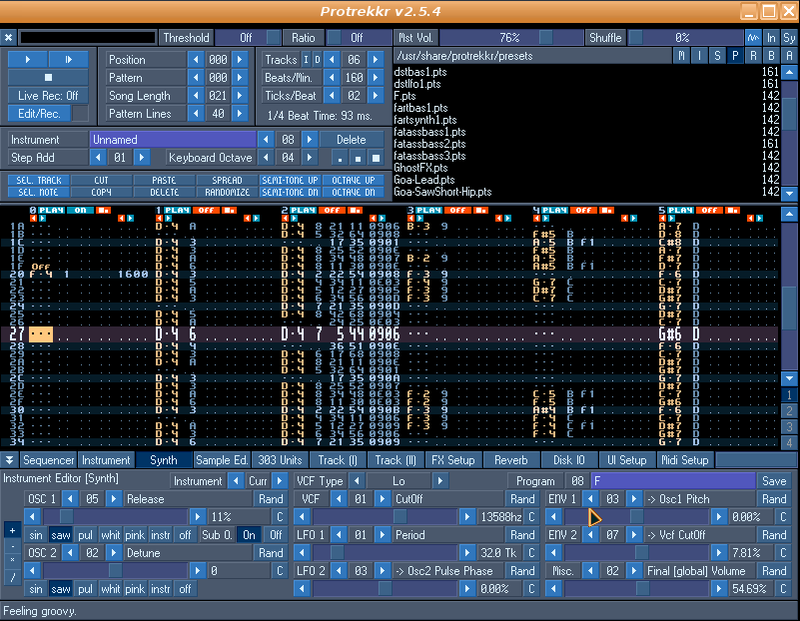 It can also import Protracker .mod files, and has MIDI input and output. The screenshots at the top of this page show only a couple of the various windows available within the main GUI page. The top section is where full song arrangements are managed, such as midi note input, instrument order, etc. The black window on the righthand side displays the preset folder's contents and path when the P button is clicked; the sample folder and path when the S button is pressed, etc. The section on the upper lefthand side allows to scroll the data in the pattern-based sequencer, select instruments, control the font size of the note roll shown in the middle area of the GUI, etc. The bottom area of the GUI has clickable tabs that allow access to the sample import and modification areas; the synth page where many traditional sound parameters such as an interesting array of filter types, cutoff, resonance, LFOs and ADSR envelopes can be controlled; the 303 section for controlling the arpeggiator section; pages for controlling various effects, such as delay, flanger, EQ and reverb; and a midi setup page. Both synth presets and full song arrangements can be saved and recalled. Audio exporting at 16- and 32-bit is also provided.